The July edition of GeoBLR featured Rahul RS from Onze Technologies. Onze is the prefered store locator infrastructure by several businesses in India including TVS, Dell and Cafe Coffee Day. The store locator is powered by Onze’s very own Latlong.in – extensive, web based points of interest and map data interface. Rahul shared the story of Latlong.in, their infrastructure and challenges mapping Indian cities. They started out in 2007 at a time when there was no reasonable geographic data source available for India – commercial and non-commercial. 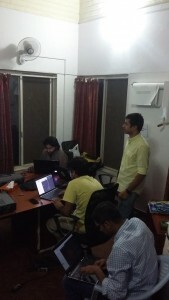 Rahul’s team gathered toposheets from the Survey of India and georeferenced boundaries to incorporate into their maps. Rahul pointed out that these are inexpensive but high effort tasks. Plus, tools to do these are expensive. In order to address India-specific mapping needs, geo-rectification needed to be inevitably supported by field surveys. Each city is unique and people entirely depend on landmarks and hyperlocal information to get around. Rahul brought in experts from different areas to gather local information. 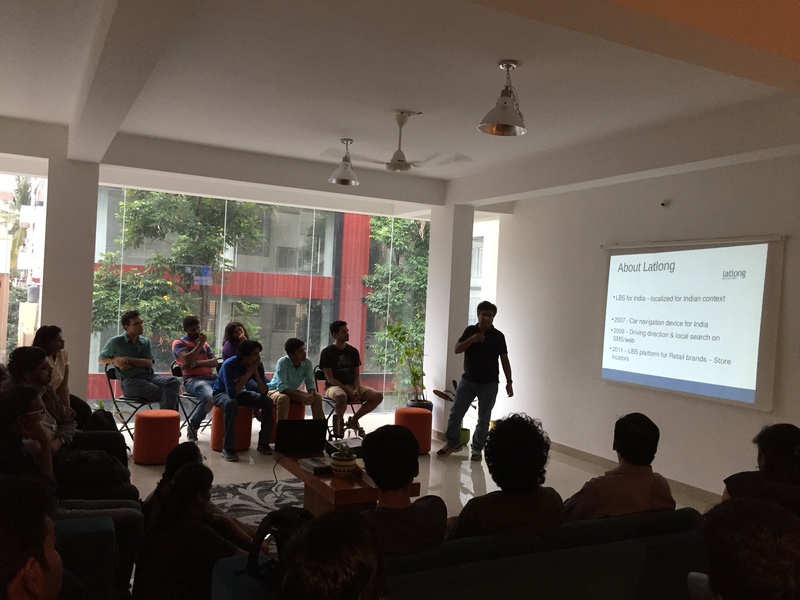 “The idea behind Latlong.in starts by saying that addresses don’t work in India”, says Rahul. 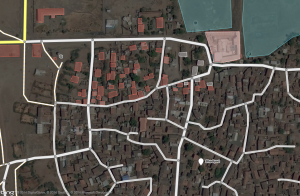 When OpenStreetMap picked up, Latlong.in moved to a mix of their data and OSM that was maintained on their own. It is a complicated effort. Conflation and dealing with multiple revisions of data is tricky and there aren’t great tools to deal with it effortlessly. Latlong.in follows Survey of India’s National Map Policy. They avoid mapping defence and high security features. Owning the entire data experience is critical to win in this market. Remaining open and improving continuously is the only way to keep your datasets upto date. 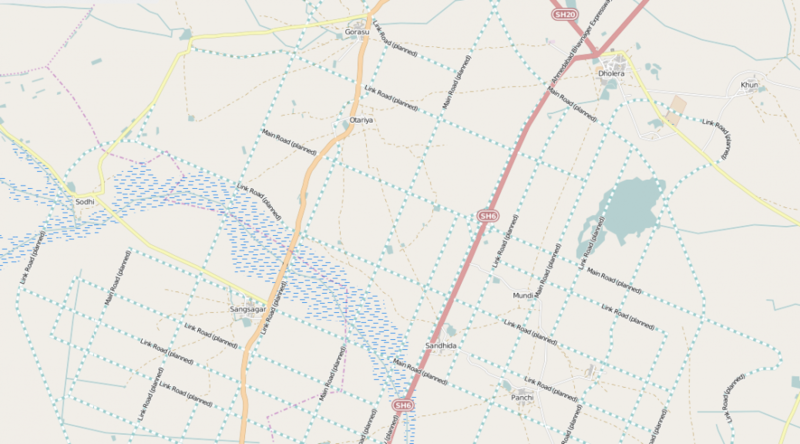 GeoBLR in 2015 – Mapping Unmapped Places! 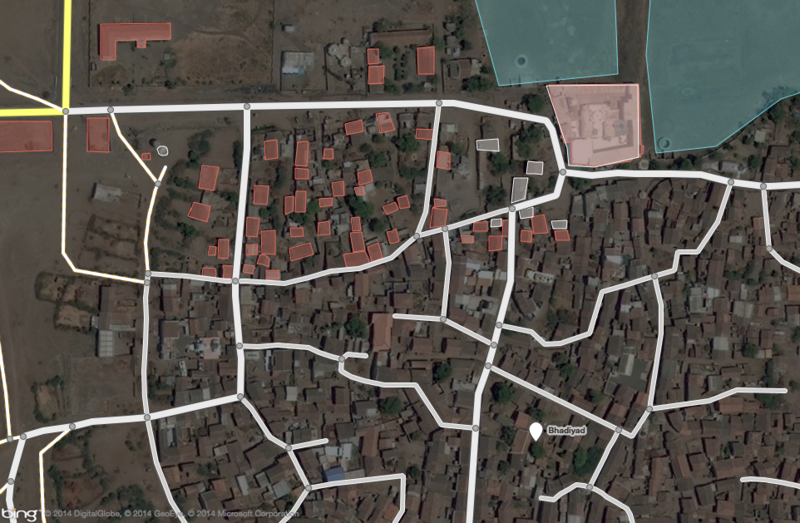 To kick things off in 2015, we met at the offices of the Centre for Internet and Society (CIS), Bengaluru to map the unmapped/less-mapped settlements along the proposed Delhi-Mumbai Infrastructure Corridor (DMIC) project. The DMIC, a 1,483 km-long development corridor spanning several states in northern and western India, has been attracting a lot of curiosity and criticism from the national and international participants and observers. The project will have built a dedicated freight corridor, several industrial and logistics hubs, and smart cities at its completion. The project has been structured to be constructed in phases. The pilot project for an integrated smart city, Dholera Special Investment Region (SIR), is underway. The quality of mapping in many regions relies on a very active mapping community, or a strong interest from a collectives and local networks. We think it is important regardless to map the assets that pre-exist around the proposed sites of developments. With this in mind, we decided to take a look at the areas earmarked for the Dholera SIR (Gujarat), Shendra (Maharashtra), Mhow (Madhya Pradesh), and Dadri/ Greater Noida (NCR). 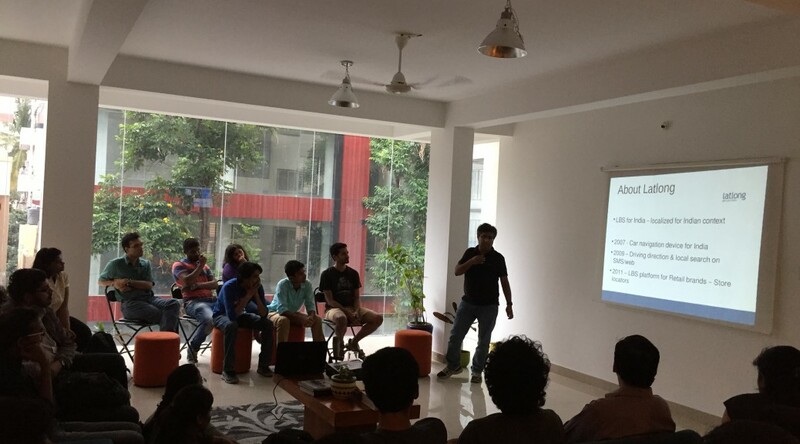 The evening began with Tejas introducing the DMIC project, the scale of new development, and the need to capture these changes for years to come on OpenStreetMap (OSM). Sajjad provided a rapid tutorial on signing up for OSM, and using the browser-based map editor. 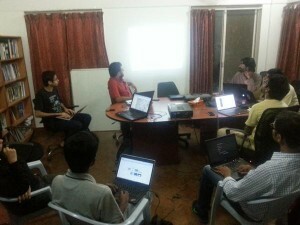 The party was attended by guests at CIS as well as remotely from Bangalore and Dharamsala. 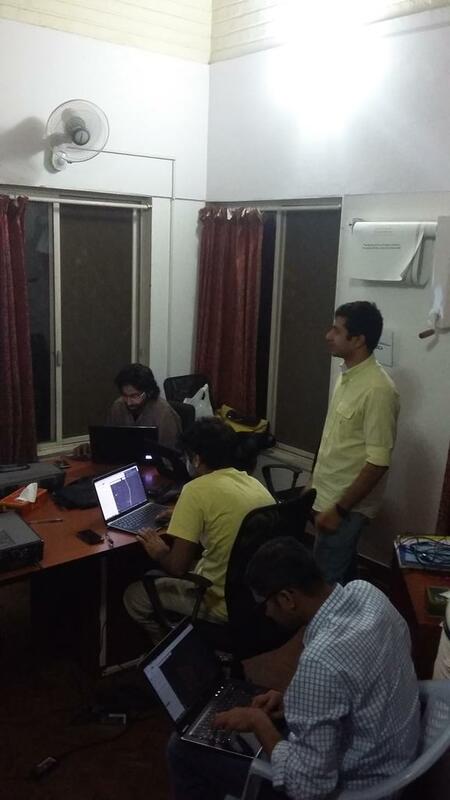 As the party progressed, several guests ended up mapping roads, buildings, and water bodies in the Dholera region. Others chose to similarly map Shendra, and Dadri.